To Do: Decorate with roses or flowers today.I always have dying, leggy roses in my garden this time of year and I bring in the petals to decorate the table. I serve something "French." If you are good with frosting, decorate a cake or cupcake with roses. Most important on this day is to try to remember her “Little Way” and do small things with great love. O Little Flower of Jesus, you have shown yourself so powerful in your intercession, so tender and compassionate toward those who honor you and invoke you in suffering and distress, that I kneel at your feet with perfect confidence and beseech you most humbly and earnestly to take me under your protection in my present necessity and to obtain for me this favor I ask (mention your request). Recommend my request to Mary, the merciful Queen of Heaven, that she may plead my cause with you before the throne of Jesus, her divine Son. Cease not to intercede for me until my request is granted. St. Theresa of the Child Jesus, pray for us. Amen. 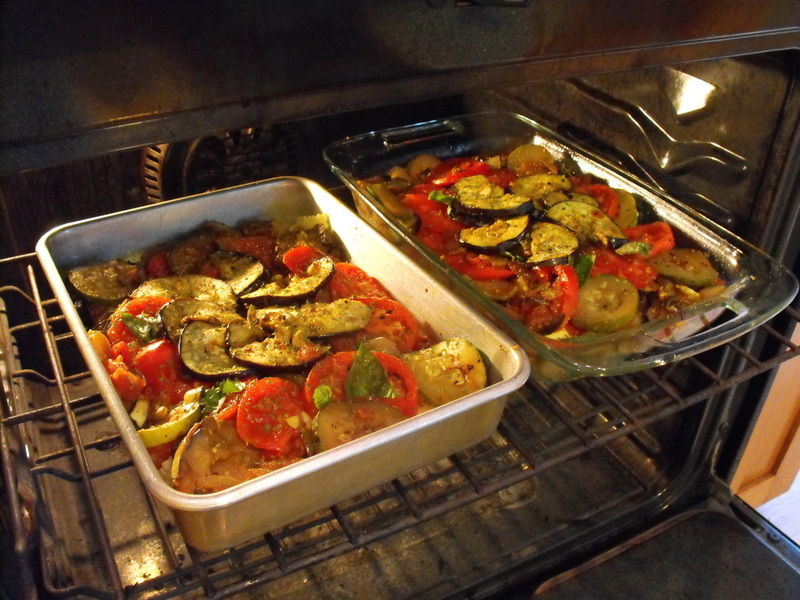 To Eat: Fall vegetables make a delicious ratatouille. 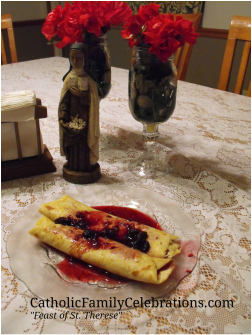 We often also have crepes. Any other traditional French meal would be appropriate. St. Therese is a wonderful saint to get to know. She never founded a religious order. She never performed great works; and never went on missions, but she understood that what matters in the Christian life is not great deeds, but great love, and that anyone can achieve the heights of holiness by doing even the smallest things well for love of God. This was her “Little Way.”Pope John Paul II named St. Therese a Doctor of the Church on October 19, 1997 and Patroness of Missions. She is one of my favorites and is known for showering her prayers on us by the sign of roses. ​There are some wonderful Youtubes about her. IF ever there was a time to gather the family around the screen this could be it! This is a nice 9 minute (part 1) YouTube (search Saint Therese of Lisuiex - The Little Flower 1/2) which tells about her life and shows many of her pictures and relics.I’ve also included a brief and easy to read aloud biography below. There is also this animated one that tells the story of St. Therese and the prisoner condemned to death. And this one by Bishop Barron is filmed on location with his insights and knowledge. One of the reasons Therese is one of my favorites is because I’ve experienced a few “mini miracles” from her and her parents’ intercessions.I’ve actually been blessed with a visit to Lisieux. Here is a brief biography to share:Therese,the youngest of nine children, was born in Alencon France in 1873. Her father, Louis, was a successful watchmaker and jeweler. Her mother Zelie Guerin, built a cottage industry in lace making, beginning in the village of Alencon, which is known for its delicate lace. She felt a call to enter Carmel as a contemplative Nun, so that she could give herself totally to Jesus. But she was too young. Appeals to the Mother Superior and Priest Chaplain yielded: “when you are old enough -16″. Not content, Therese and her father appealed to the Bishop. Not getting the response she wanted, she appealed directly and personally to the Pope while on a parish pilgrimage to Rome. Therese had always said: “I want everything”- and she usually got it. Persistence paid off. Therese was allowed to enter the Lisieux Carmel at the age of 15 – her father lived to see her professed a Carmelite Nun. She took the religious name of Sister Therese of the Child Jesus and the Holy Face. God’s spirit worked powerfully in Therese, so open was she to Divine Love. Still dreaming of taking on the world as a priest and missionary, she wrestled with her vocation and place in the Church. Finally she came to realize that her “vocation is love” – the love of God was the energy source for the Church – and fulfillment of the human heart and longing.